Not long after we arrived in Poland, Ed’s supervisor visited from Florida. I was seated next to him at dinner one night, and the meal we’d both ordered included a side of Czerwona Kapusta (Polish Red Cabbage). After tasting his, John leaned over and said, “mine is better.” To which I replied, Well then, I’d like to have your recipe. 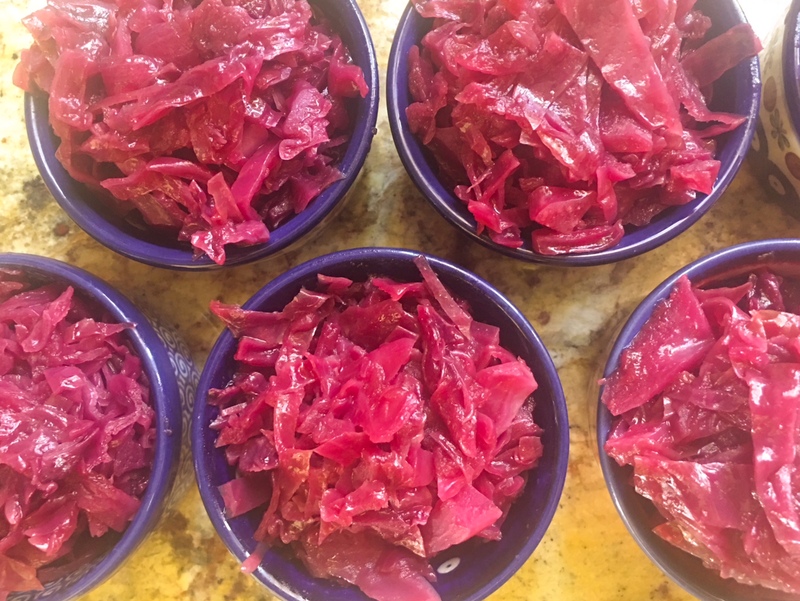 You might not picture red cabbage as a well-known dish in Florida and you’d be correct, but John’s wife grew up not far from where we were dining. They have a home there and spend a lot of time in Central Europe, so he had some credibility. Like so many home cooks, John wasn’t someone who used a recipe, but it did his best to put it in writing, and I’ve loved the results. The blackberry preserves refresh the color of the cooked cabbage. The sweet and sour taste is balanced by the savory warmth of the onion – very tasty, and John tells me it freezes well. It’s so popular that my mother has made it a regular feature on her Christmas Eve menu. I hope you’ll enjoy it too. Can you believe I’ve never tasted cooked red cabbage? My neighbor makes it every single Thanksgiving and Christmas. I’m going to have to try this recipe. This sounds so much better than the red cabbage recipe I’ve used before. I usually cook it only at Christmas, but I don’t think I’ll wait that long to give it a try. Wow, look at that color!!! I love cabbage – thanks for sharing the recipe. I like the addition of the blackberry preserves….nice job on breaking 500!!! It sounds good. I’ve never had this but does it really have to cook for an hour? What is the texture like? Can you use apple cider vinegar? The texture is pretty soft; it’s definitely a cooked cabbage as opposed to a salad. If you want it crunchier, you could cook it for less time. I think apple cider vinegar would be great! Loved your cabbage rolls! So much better baked in the oven than in a pot of the stove. 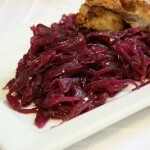 Gonna try your red cabbage soon – ate it all over Germany! Thanks for the divine meal you fixed for my sister, husband, & myself! You all were so gracious & such fun. I would say room temp to hot. Hi Mary ann, I think you could use carrots, but if you omit the preserves, you would want to add a little sugar, or maybe marmalade or other jam. It’s there to offset the vinegar and provide a sweet and sour flavor. Thanks for getting back tome so quickly!